This page lists the groups you are related to in some way. 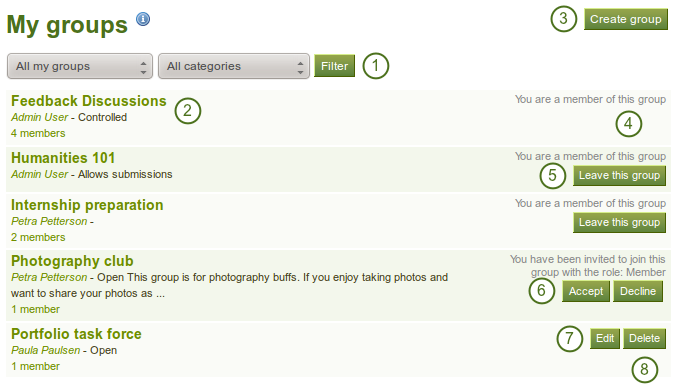 You can see the groups you own or are a member of, as well as groups you have been invited to or have asked to join. Groups by a specific category if group categories exist. All the groups that you have access to are listed with group title, administrator, description, group type and number of members if the admin discloses this. If you are a member of a controlled membership group, you cannot leave the group. Click the Accept or Decline button to join a group to which you have been invited or to decline membership in that group. Click the Edit button when you want to update the details for a group in which you are administrator.